Seventy years after its foundation, the road to peace and global justice still does not run through NATO. But whatever its latest rationale, its core purpose remains the same: to advance American interests. At the end of the Cold War, the hopes of many people were that a peaceful world order would emerge. But while the Warsaw Pact may have disappeared, NATO certainly didn’t. Rather than scaling back its military presence, the US moved to fill the positions vacated by its departed rival. As the countries of eastern Europe transitioned to market economics and multiparty democracy, the US moved rapidly to integrate them into its sphere of influence. Czech Republic, Hungary and Poland joined NATO in 1999, Bulgaria, Estonia, Latvia, Lithuania, Romania, Slovakia and Slovenia in 2004, Albania and Croatia in 2009 – and Montenegro in 2017. Macedonia and Bosnia and Herzegovina will be next. Ten days after the Czechs, Hungarians and Poles joined in 1999 they found themselves at war with their neighbour Yugoslavia, as part of a NATO bombing campaign that was without valid legal basis. That cynical and baseless war brought devastating human consequences to what remained of Yugoslavia – including a legacy of toxic depleted uranium. It was also the first use of Tony Blair’s so-called ‘humanitarian’ war theory which proved so useful in the run-up to Iraq as a justification for wars of intervention that are illegal under international law. Developments at that time went in wider directions too. At NATO’s fiftieth anniversary conference in Washington in April 1999, a new ‘Strategic Concept’ was adopted. This moved beyond NATO’s previous defensive remit to include ‘out of area’ – in other words offensive – operations anywhere on the Eurasian landmass. Nowadays we might say that this fits neatly with President Trump and John Bolton’s international ambitions, and it certainly facilitates them. But it’s important to remember that it didn’t start with there. Since the late 1990s NATO has explicitly claimed a role for itself in pursuing conflict around the world. You don’t need to sympathise one bit with the Russian government to recognise that increasing NATO presence in eastern Europe has been a contributory factor to the conflict between Russia and Georgia in 2008 and the continuing crisis in Ukraine. In addition to opening new bases, NATO has also opened a training centre in Georgia and has committed to supporting the reform of Ukraine’s military, which has formally integrated extremist groups like the Azov Battalion. NATO’s response to escalating tensions in eastern Europe in recent years was to deploy troops – including British forces – to Estonia, Lithuania, Latvia and Poland. The UK has major involvement in NATO exercises, around 100 took place in 2017 alone. Major exercises have taken place in Scotland and recent B52 exercises over the North Sea were run from UK bases. But perhaps NATO’s most renowned contribution to international politics in recent years has been its war in Afghanistan – the longest major conflict of modern times. Begun by President Bush in 2001 – the first step in his ‘War on Terror’ – it continues today, involving all NATO countries. Despite NATO officially ending its mission in 2014, it has since launched a new ‘non-combat resolute support’ operation, meaning thousands of troops remain in the country. Ostensibly intended to drive out the Taliban and destroy al-Qaeda, the war helped create and strengthen the conditions for a surge in terrorist organisations and associated fighting forces that continues today. All while, unsurprisingly, failing in its mission of assisting the creation of a stable, post-Taliban Afghanistan. NATO’s War on Terror has also reached Africa in recent years. Libya has been destroyed, with horrendous consequences. Not alone is Libya now a failed state divided between warring factions, it has also seen the introduction of a kind of modern day slavery and the abuse of African migrants on an enormous scale. Libya’s destruction greatly worsened the refugee crisis of recent years, not only producing refugees from the country itself but also by opening refugees seeking safe passage up to exploitation by warlords and human traffickers. And for those fortunate enough to set sail across the Mediterranean, NATO has also sent military boats to the Aegean to protect western interests. The United States continues to press other states to pay for its expansionary policies and wars. Of course, NATO’s role as a nuclear-armed alliance continues, with B61 nuclear bombs currently being upgraded to the B61-12 to make them more ‘usable’. These are stationed in five countries across Europe – Belgium, Germany, the Netherlands, Italy and Turkey. There is strong opposition to the siting of these weapons in Europe, including from the governments of some of the ‘host’ nations. The UK’s own nuclear weapons system, Trident, is also assigned to NATO. Worldwide, the demand for peace has grown after the disastrous interventions of recent years. Real peace means social justice, environmental security, equal access to resources, and a warm welcome for refugees fleeing wars and oppression. It has been sad to hear members of the Labour front bench speak in glowing terms about NATO, suggesting that it is a force for democracy, solidarity and peace. Labour’s last election manifesto, so path-breaking and inspirational in so many ways, regrettably maintained a continuing commitment to NATO, proudly stating that the last Labour government spent above the NATO benchmark of two per cent of GDP. When Labour is challenging so much, surely Britain’s role in the world can be rethought too, rather than merely regurgitating the failed foreign policy of successive governments. These commitments cannot go unchallenged. They breed war, global injustice and inequality, and these are what the peace movement campaigns against. 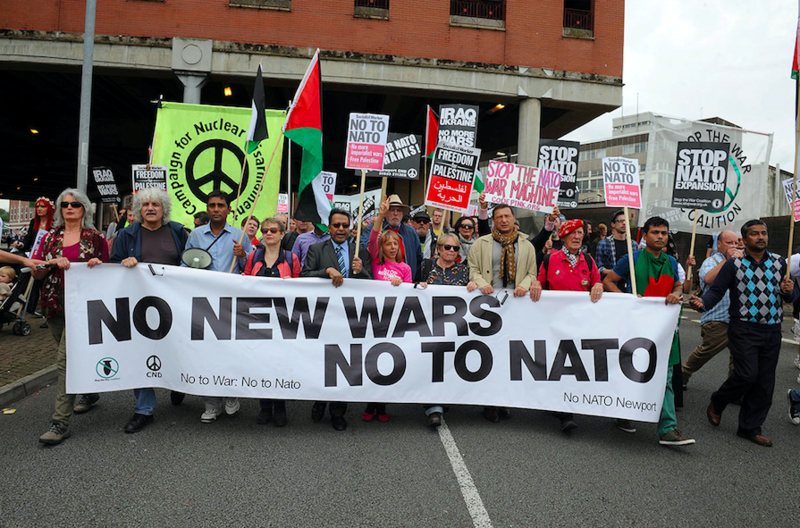 We have marched at NATO summits, with the movements from Europe, the US and beyond, against its nuclear doctrine, its expansionism, and its destabilising global power grabs. And we will continue to do so, and to argue for an alternative, whoever is in government, because to condone and embrace NATO is to abandon the cause of peace. The truth is you can’t pursue the vision that the Shadow Foreign Secretary claims for Labour – “to put Labour values at the heart of the world order, to be a beacon in every corner of the globe for the values we believe in here at home” – if you play a leading role in NATO’s aggressive approach to international affairs and replace the Trident nuclear weapons system. In what sense could a Britain under a pro-nuclear, pro-NATO Labour be “a beacon in every corner of the globe”? Enthusiasm for militarism is not something that earns Britain respect internationally. A new approach to international relations is required – and membership of NATO should play no part in that. Kate Hudson is the General Secretary of the Campaign for Nuclear Disarmament (CND).